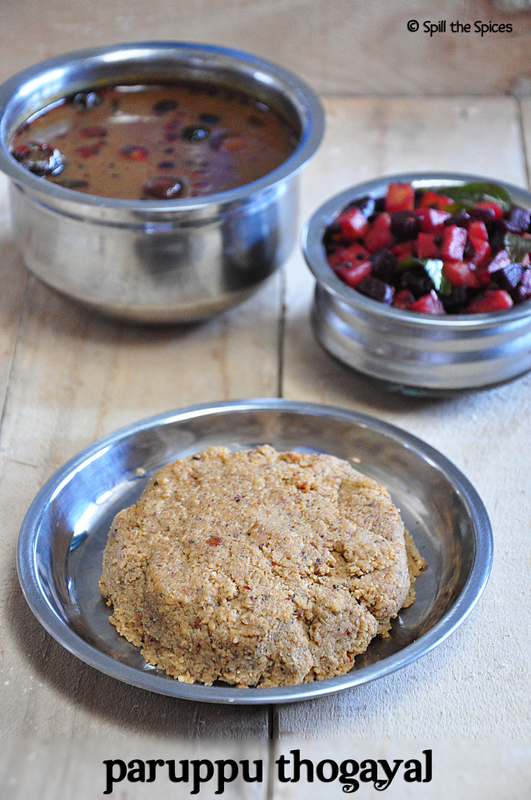 Paruppu thogayal is a simple and easy, coarsely ground thick chutney made with toor dal (yellow pigeon peas), dried red chillies, coconut and peppercorns. 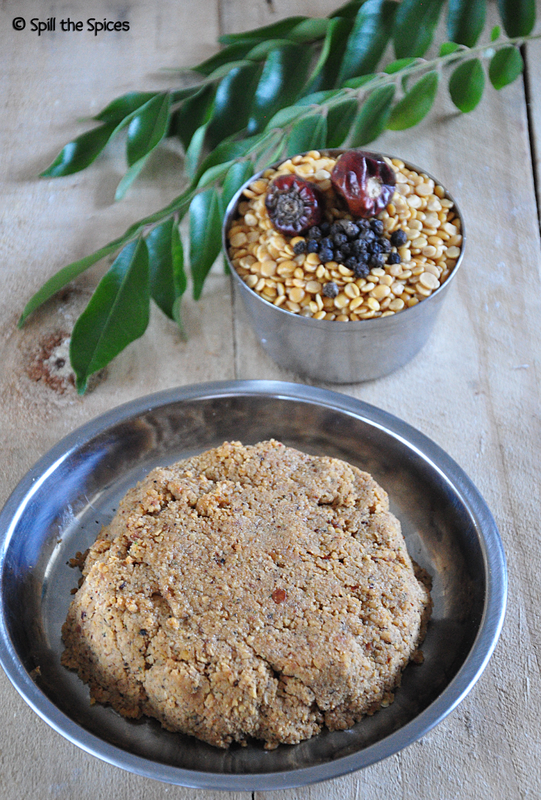 Paruppu thogayal goes well with rasam, kuzhambu varieties like vatha kuzhambu or kara kuzhambu and even with curd rice. It can be also served with idli and dosa. The thogayal stays good for 3-4 days when refrigerated. Thogayals come to my rescue on days when I feel exhausted to cook a complete lunch meal. This paruppu thogayal with hot steaming rice and dollop of ghee alone makes a delicious and comforting meal. Traditionally curry leaves are not added, but I like the lovely flavor and aroma it imparts to the thogayal. 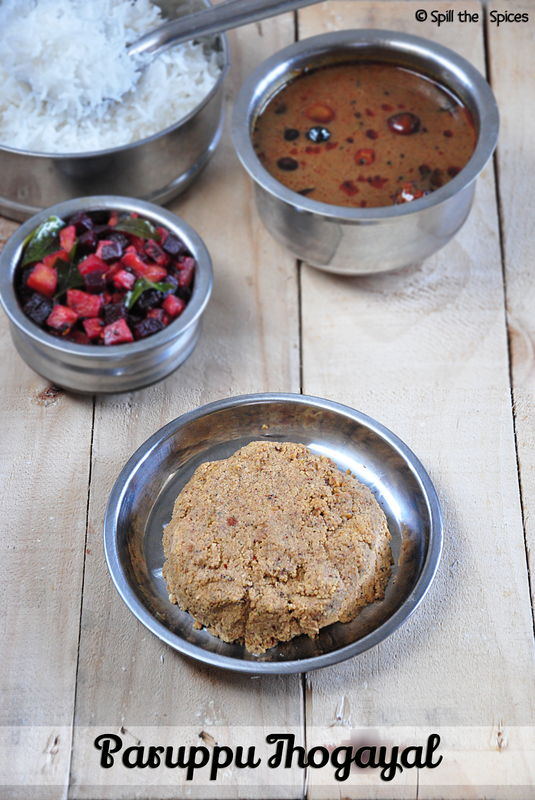 Whenever I make vatha kuzhambu, I make this paruppu thogayal as they make an excellent combination. Off to the recipe now! 1. Heat ½ tsp oil in a pan and add the toor dal. Fry in medium flame till golden brown. Set aside to cool. 2. Add the remaining ½ tsp oil and add peppercorns, red chillies and asafoetida. Fry for 1-2 minutes or till the peppercorns start popping. 3. Add garlic, curry leaves and fry for few seconds. Then add coconut and fry for 2-3 minutes. Set aside to cool. 4. Once everything cools, first grind them without adding water to a coarse powder. Then add water and grind to a semi coarse paste. Adjust the amount of red chillies according to your spice level. Use 2 chillies for a milder thogayal. I love the subtle flavor of garlic in the thogayal but you can skip the garlic if you don't like it. Do not burn or over roast the dal, else the thogayal will taste bitter. my fav with more kulambu! looks so yummy the whole platter. Wow..this a soothing recipe...very nostalgic feeling!! Lovely thogayal! Perfect with vatha kuzhambu! Delicious paruppu thogayL.. love to have it with rasam. delicious parippu thogyal love it. Delicious thogayal, well presented and looks inviting. Healthy and delicious looking thogayal. Btw what's the veg curry in the pic? Its a simple stir fry with potato, carrot and beetroot. thogayal looks superb and delicious.. very nice clicks.. Absolutely delicious and healthy thogayal. Such a comforting food, love simply with a bowl of curd rice.